As a professional photographer, Varisco has stuck with the theme of her native changing coast. 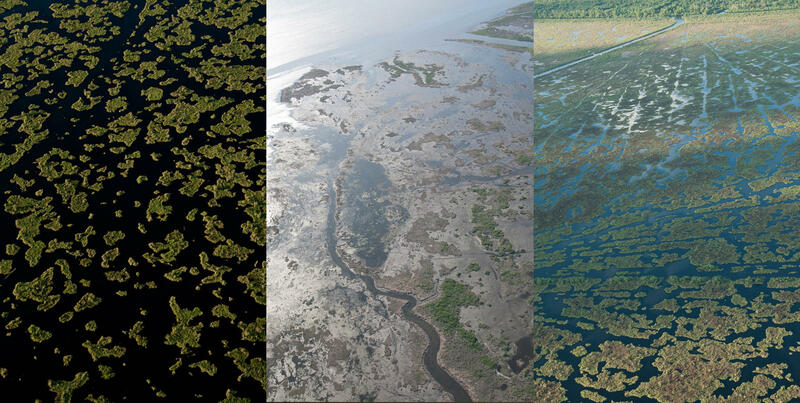 For the past decade she's documented coastal erosion from distinct vantage points, including a small airplane, a great perspective to see geographic shifts in the wetland landscape.  New Orleans photographer talks with WWNO Coastal Reporter Jesse Hardman about documenting the dynamic Gulf Coast with her camera. 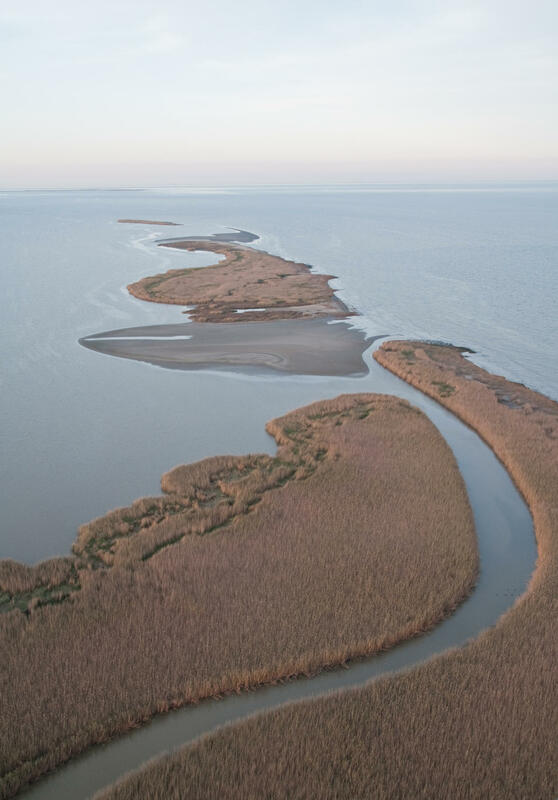 Varisco spoke with WWNO coastal reporter Jesse Hardman, and started the interview by talking about a photo from her series titled "Shifting", shot from up above St. Bernard Parish. "Fort Proctor" depicts land loss near the Mississippi River Gulf Outlet by showing the isolated 19th century Fort as a tiny speck, surrounded by water, as land pulls back along the coastline. "To the right is a canal that's cut out of the marshes, that's allowing salt water into the fresh water marsh, disintegrating the marshes," she says. 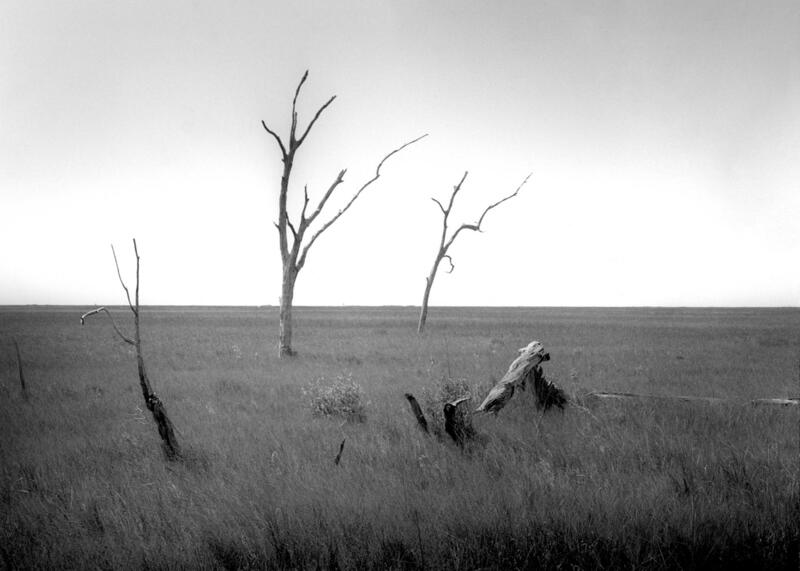 "When I took this picture, I was looking for descriptors of land loss that would make sense to even a child. Just the simplest version of what was happening." Varisco also likes to experiment with how she shares her photos. She included "Fort Proctor" in a series of images that she printed on silk. The display was 12 feet tall, and stretched along a 35-foot wall. Varisco says making the photos enormous, and giving them movement through the silk, adds a layer of understanding of the images themselves. "I liked the idea of the pieces suspended in the air, when people would walk through them, or up to them," she says. "The piece would move in relationship to the movement of the viewer. It was my little subtle way of showing how we effect change." Varisco's photos are collected in her book Shifting and have been shown locally at the Ogden Museum of Southern Art in New Orleans, the Acadiana Center for the Arts in Lafayette, and the Bayou Terrebonne WaterLife Museum in Houma. She's also shown her work in China, Los Angeles, New York and Vermont. Varisco says at her Houma show, "the appreciation was pretty intense." She says visitors shared personal stories of coping with land loss, including stories about drilling holes in the floor of family camps to allow storm surges to drain. At her show at the Ogden Museum, she says a woman approached her with tears in her eyes. The woman explained that she'd been living in Terrebonne Parish and had moved her family away because of the disappearing coast. "It was just too painful for her to watch it go," says Varisco. "So they moved away. And then she brought her son back to Louisiana to come to school here for one year, just so he could see, for himself, how beautiful this place is." Varisco says she does see some hope while flying above Louisiana. She says she got excited when she saw Pass a loutre, an area in Plaquemines Parish at the mouth of Mississippi. The tributary is a popular nesting ground for birds and also a fish hatchery. "It's allowed to grow. It's just this organic meandering form." "When you are looking from the bird's eye view, it helps us to see what's happening to the land. Almost like looking at a little petri dish. You've got the height and the distance from the subject, it gives you the perspective on it that's different than when you're right in the field." 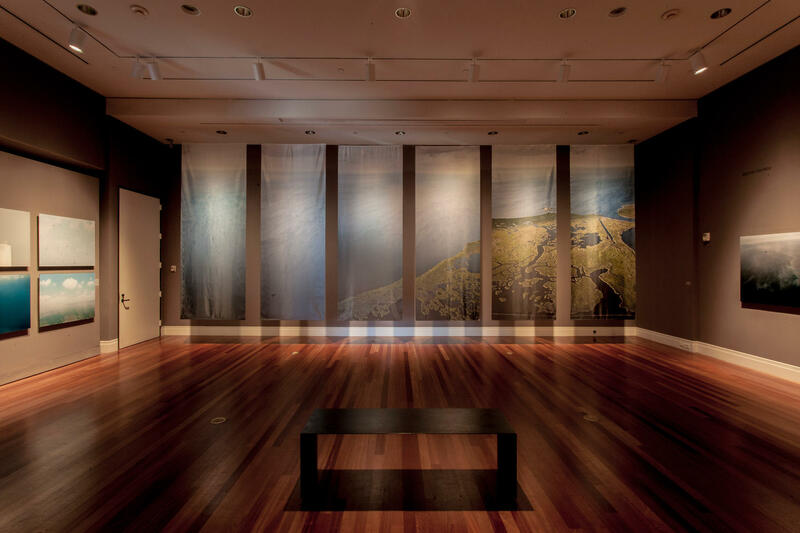 For her piece "Land use," Varisco brought together three images: a levee, a town along a canal that leads to dying marshes, and a petrochemical factory. Varisco says with "Land use" she wanted to capture what society is doing with land in unsustainable ways, the fact that humans are not co-existing with nature. "I think that the decisions that we've made to sustain our life in some ways have affected land loss, and accelerated it probably ten times what it would have been naturally." Varisco says when it comes down to it, her work stems from a desire to explore how humans live with nature: "It's a simple question." "This is like gold, this is our most precious asset, and we're taking this golden path and turning it into asphalt in a way. Asphalt that's sinking. What we're doing is trashing our most vital resources, and our protection. That's part of the wonder of what I'm trying to look and think about as an artist." 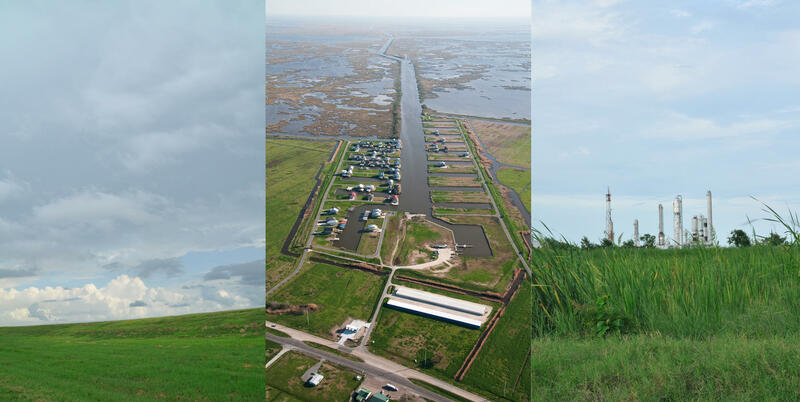 Top academics and practitioners in the field of environmental restoration are in New Orleans this week, meeting as part of the 2014 Conference of Ecological and Ecosystem Restoration. 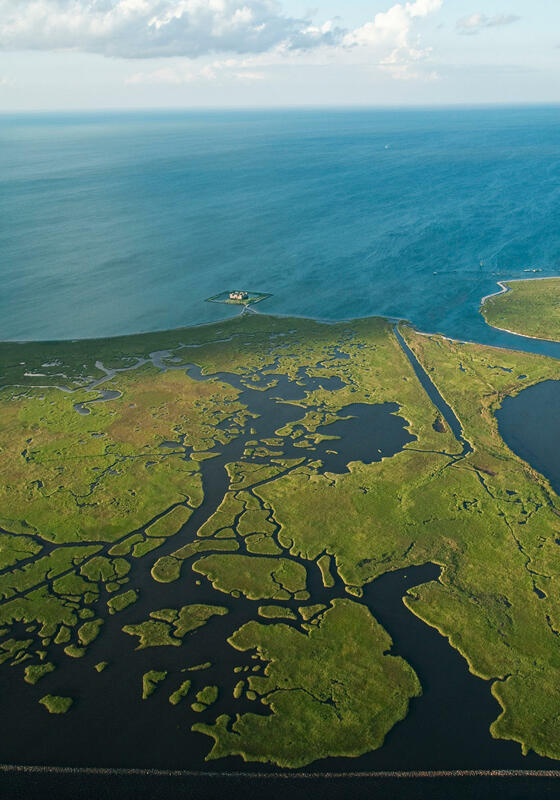 Experts will be sharing coastal restoration examples from the Gulf of Mexico to the Persian Gulf, from Southeast Asia's Mekong Delta to the Mississippi Delta. On this week’s Notes from New Orleans, Sharon Litwin talks with local photographer Frank Relle about his recent experience inside Moscow’s art world during the height of the Crimea and Ukraine crisis. Relle curated an exhibit called "New Orleans in Photographs" for the Moscow House of Photography. To read more about his experiences, visit NolaVie.com. It’s been 450 years since Shakespeare’s heyday. One has to wonder what the Bard of Avon would think of the myriad ways his plays are being presented these days. On this week’s Notes from New Orleans, Sharon Litwin talks with Chaney Tullos, Director of Operations of the New Orleans Shakespeare Festival, about their innovative yet traditional approach and their collaboration with Compleat Stage.